If you take the main road from Halesworth to Southwold and the sea, it isn't long before your eye is distracted by the great tower of Blythburgh church, the self-proclaimed cathedral of the marshes, like a great ship riding the land. This may distract you from the road sign pointing off the road to the south which declares Mellis 1/2. If you did spot it, you would probably think to yourself, hang on, I thought Mellis was up near Diss? And you'd be right. It is a mistake. However, some local has helpfully scratched off the i, and instead you cross the infant River Blyth and enter the tiny hamlet of Mells. Pevsner places it in Holton parish. Historically, it was part of Wenhaston, the village centre of which is about two miles away. Whichever, it can never have been very big, half a dozen houses at the most. Behind them, the hill rises steeply, and Old Chapel Farm is a clue that we have found what we came to see. The manor here was held by Mettingham College, and it isn't clear to me if the chapel that stood in this hamlet was a chapel of ease to Wenhaston, or for the College of Priests. It was dedicated to St Margaret, a popular Saint in this part of the county. 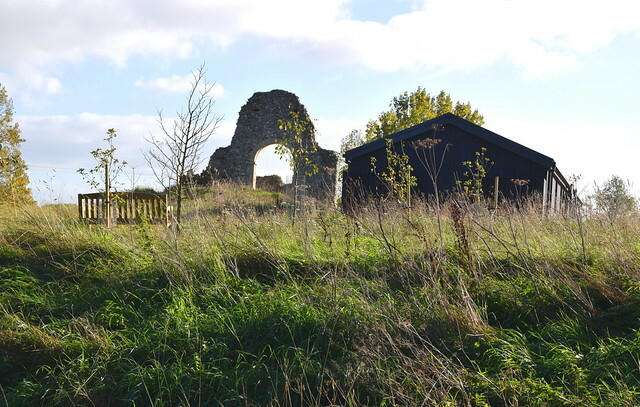 A document of 1550 says that it was not used after 1465, which coincides with the start of the greatest phase of Suffolk church-building. Intriguingly, after the dissolution the manor was granted to Thomas Denny, a relative of one of William Dowsing's more prominent deputies. If Dowsing came to Mells nowadays, he would not find much to disagree with. All that remains is the chancel archway, clearly Norman, and part of the wall above it. The ruin sits on private land, and cannot be approached. When Dutt came this way in the 1920s, he said it had an apsed east end, though this is hard to tell now. The farm buildings beside it appear to have been converted into holiday homes since I last visited in 2002, but otherwise, only sheep pick over the ruins. Most people in Suffolk probably don't even know about it.